Building an annexe is a great option if you're considering extending your home due to a requirement to accommodate independently minded teens, young adults who can't afford their first step on the property ladder or elderly parents who need support without loss of self sufficiency. Annexes provide a happy mix of independence and proximity required in each of those situations. Find out more about extending a house and adding a garden room – both will help with your annexe design. Renovation experts Michael Holmes and Jason Orme explain the rules for creating additional rooms that will utilise your outdoor space and enhance your lifestyle. An annexe is, by definition, associated with the main home. In most cases, it will offer a degree of independent living that gives it the feel of the occupier’s own space. For most people, a ‘granny annexe’ would offer a self-contained bedroom and living room, a bathroom and kitchen area. This allows the occupant to live in it without needing to use the main house. Do I need planning permission for an annexe? 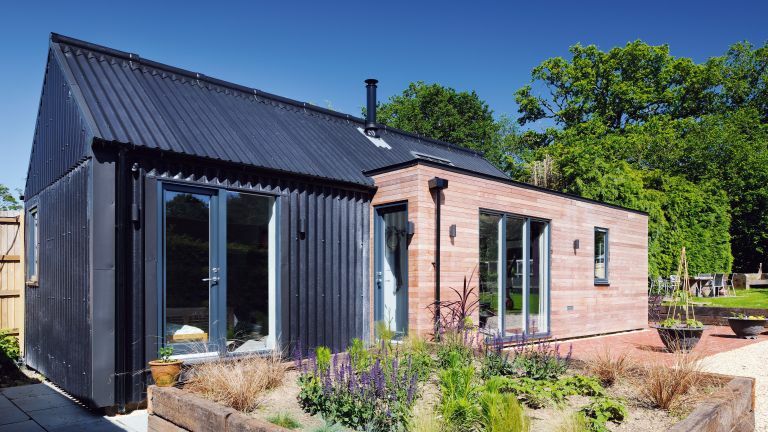 You will need planning permission to build a habitable annexe in your garden but wouldn’t for something like a shed, summerhouse, or a garage. A good way of thinking about it is that if your garden building, of whatever size and shape, is going to be slept in, it needs planning permission. You can find out more from your local council or planning portal. It is worth working with an architect or architectural designer to create a bespoke scheme for your property before applying for planning permission, particularly if they specialise in outbuildings, as they will know what’s allowed for your property type, whether you live in a listed building, or within a Conservation Area or other some other designated area. If planning permission is granted for an annexe, it is likely to include conditions that restrict occupation of it to members, guests or dependents of the household, and will also prevent the separate sale of this part of the property. Could you build under permitted development? Permitted development (PD) allows householders to improve and extend without full planning permission. However, there are limitations on the height, size, type and location of structures built under PD, and also limitations on the use. Class E of permitted development allows development within the ‘curtilage’ of a house, providing these comply with certain design limits and the use is for purposes ‘incidental’ to the enjoyment of the house. So this could mean anything from garden store to a gym, swimming pool enclosure, art studio, cinema, hobby room or even somewhere to keep animals. It can’t be for a purpose ‘ancillary’ to the main house, which is what a self-contained annexe with bedroom, bathroom and living room would count as. A home office might be classed as incidental, if it is only used occasionally, but if it is your regular place of work, the use would be considered as ancillary and require consent. The total area of ground around the house covered by additional buildings must not exceed 50 per cent (excluding the original house). Outbuildings must not be any further forward than the principal elevation of the house. On a corner plot, this includes the side elevation. Outbuildings must only be single storey and no more than 4m high with a dual-pitched roof, or maximum 3m otherwise. The eaves cannot exceed 2.5m in height. If within 2m of a boundary, then no part of the building can exceed 2.5m in height. For houses in designated areas, new outbuildings must be located behind the rear wall and not on land adjacent to the side elevations. Plus, outbuildings cannot exceed 10m² if located more than 20m from any wall of the house. The building must be detached to be classed as an outbuilding. How is my planning application decided? It depends on both the local authority and, often, the planning officer. Some are notorious for having policies within their local planning framework that prejudices against annexe applications. Investigate your own local authority’s relevant planning policies (found in the planning sections of their website), and ensure your application is consistent with their policy, and you’re off to a good start. Be very careful if you choose to go ahead with getting planning permission – it could be a problem if you decide to sell the house in the future, as you’ll need to be able to prove that approval was given for the annexe. If you then try to retrospectively apply for permission, or claim that it was covered by permitted development, you’ll find most appeals consistently rule against approval. If you have an existing outbuilding or unused garage – attached or detached – that has enough space to provide additional living room, you can convert it to create an annexe capable of providing independent accommodation without planning permission. This means that existing outbuildings, including those previously completed under PD, do not require permission for a change of use, so it may be possible, in situations where the local planning authority refuses to grant consent for a residential annexe, to construct a PD-compliant outbuilding and then later undertake a change of use without permission. Exclusions will most likely apply if you live in a listed building, Conservation Area, Area of Outstanding Natural Beauty or National Park. A change of use to an existing garage or outbuilding doesn’t require planning permission if a building is listed, but any material alterations required in the conversion process will need listed building consent. New outbuildings in the grounds of a listed building will need permission, but the new structures will not be listed, while alterations to outbuildings that are ‘curtilage listed’ within the grounds of a listed property will require both listed building and planning consent. Looking for more advice for extending your home?